Still have shopping to do? Have no fear! Gift Week is here! These Charm Necklaces go with everything in your wardrobe so it’s no wonder that they are the essential go-to accessory. Each charm features a different motivational word or phrase to help inspire and uplift whoever is wearing it. Their delicate details and simple design appeal to everyone’s tastes, making them the perfect gift and stocking stuffer. 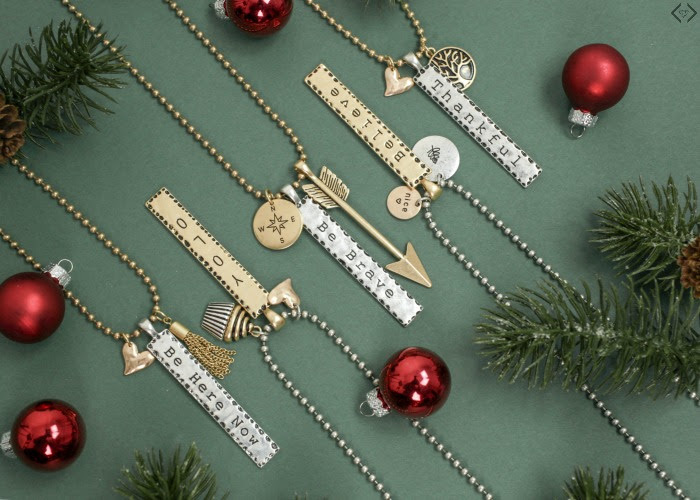 Charm everyone’s socks off with these darling charm necklaces that you’ll love so much, you may end up gifting yourself one. And don’t forget to take advantage of the gift wrapping option! It’ll make your life SO much easier! The code is CHARMGIFT and it will make each necklace just $11.99 with FREE SHIPPING! The code is valid 12/3 through 12/6. Layering with your accessories! You can wear several charm necklaces together or pair one charm necklace with other styles of necklaces that have different lengths.